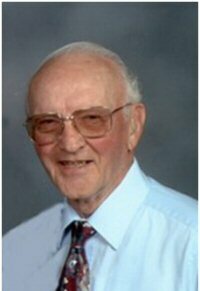 I was born Novemnber 8, 1923, to Clarence J. and Josephine L. Vogel Hoodin in Tipton, MO. I Graduated from Tipton High School. 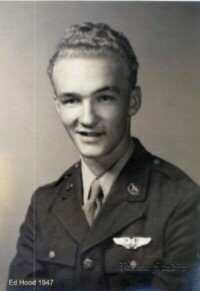 I was inducted in the Army Air Force in February 1943. I soon found that army life would be much different from civilian life. Basic training was very rigid both for the mind and body. This was necessary, however, to prepare the body for combat if needed and the mind to follow orders without question. Next I was sent to radio operators school to learn Morse Code. From there I went to Yuma Arizona to gunnery school to learn how to fire 30 and 50 caliber machine guns from an aircraft to targets on the ground and moving targets pulled by other aircraft. I was then assigned to a crew on B17 aircraft with the 8th Air Force in Ardmore Oklahoma. I was then transferred to a B29 outfit in Salina Kansas, and from there sent to Guam in the Mariana Islands with the 39th Bomb Group of the 20th Air Force. The trip to Guam was no fun as we were all sent by boat that criss-crossed the Pacific taking 30 days to make the trip. Guam is about 5 miles wide by 30 miles long. All the buildings were leveled by the war and most of the people set up grass huts to live in. The 39th bomb group was at the north end of the island and the airstrip was just finished to accommodate the B29 Aircraft. The jungle was just cleared away and we had to sleep on the ground. There were lots of lizards, but they were the kind that didn’t bite. Eventually they erected Quonset huts for us to live in so we could sleep on cots. I was on Guam for one year until the end of the war and was discharged from the Army Air Force in February 1946. 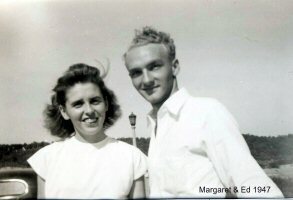 I married Margaret M. Forck in Jefferson City, MO on Apirl 24, 1948. We have four children: Thomas, Kathleen, Deanna and Anthony; 9 grandchildren and 21 great grandchildren. We were married 60 years until her passing in October 2008. I worked for Jefferson Distributors from 1960 until my retirement in 1987 as Appliance Manager. I also worked for Strong Brothers Lumber, Hoods Garage, Central Missouri Motors and Dan Coppan Lincoln Mercury. I'm a member of Immaculate Conception Catholic Church, the Holy Name Society, Knights of Columbus Helias Council 1024 and the American Legion. My hobbies include stamp collecting and coin collecting, barbequing and playing horseshoes. Edward H. Hood took his Final Flight on May 11, 2009. Mass of Christian Burial was held at on May 15, 2009 followed by interment with full military honors in the St. Francis Xavier Cemetery, Taos, MO.